The Marshall Government has come in for stinging criticism in a keenly-anticipated Royal Commission report on the River Murray’s management that found the Murray-Darling Basin Authority acted unlawfully, calling for a complete overhaul of water allocations across the system. The inquiry was set up by the former Weatherill Labor Government, and commissioner Bret Walker has endured a tense relationship with the Liberal administration, which has consistently emphasised the financial burden of his deliberations – despite the commission coming in around $3 million under its $8.45 million budget. But Premier Steven Marshall and his Environment and Water Minister David Speirs have already rejected one aspect of the report, which slammed the SA Liberal Government for kowtowing to the Commonwealth and upstream states over its decision to endorse “new criteria” proposed by the New South Wales and Victorian Governments at a ministerial conference last year “for the approval of efficiency measures to recover 450 GL of upwater”. Walker’s report damns the agreement as “remarkably ill-advised”, with policy formulation “based solely or largely on the subjective views of communities affected by a lack of understanding and access to relevant information”. “In the absence of any reasoned explanation for this change in position… it can be inferred that the South Australian Government’s agreement to the Agreed Criteria was only reached on the basis of a political compromise,” it notes. He went on to argue the decision was “so contrary to the interests of South Australians that the decision by the Minister responsible [Speirs] is almost certainly a breach… of the South Australian Ministerial Code of Conduct, in that no Minister acting reasonably could consider these changes to the criteria to be anything but totally antipathetic to the interests of South Australia, and the South Australian environment”. He called for SA’s agreement to the changes to be “immediately reversed”. But Speirs insisted he “stands completely behind the decisions that were taken” at the ministerial summit. “I’m disappointed by that response,” he told media today, calling it an “isolated comment” about broader matters, including the receipt of $70 million for the Coorong river. The Royal Commission report comes as InDaily today reveals Speirs’ own department is facing a major restructure, with a focus on “economic development” and staff and budget cuts. The Commissioner also attacked an agreement at the same ministerial council to “investigate the contribution” that the Adelaide Desalination Plant could make “to support the implementation of a socio-economically neutral 450 gigalitres efficiency measures program”. “Why the South Australian Minister agreed to this proposal is not clear,” Walker writes. “This is particularly concerning, given that the relevant South Australian Department received a comprehensive, independent cost-benefit analysis in June 2016, that determined the desalination plant should only be used when temporary water market prices reach a critical price point, namely above $510 per megalitres. He surmised Speirs “was unaware of this report, has determined it is deficient in some way or has simply chosen to ignore its existence”. “All of these scenarios are concerning,” he says. Walker points out that using the desal plant to “substantively reduce South Australia’s reliance on the Murray is in danger of overlooking the significant ecological and economic benefit that surface-water flows in the Basin provide, including those flows that run through South Australia”. He notes these points “were made in a compelling fashion” by water economist Sarah Ann Wheeler in an August 2018 article that was published by InDaily. “Either the Minister was unaware of this article and the arguments therein, has determined they are deficient in some way or has simply chosen to ignore them,” Walker writes. The commission report released found river allotments were driven by politics and accused the basin authority board of maladministration over its disregard for science, saying water levels must be determined on a scientific basis and in accordance with reconstructed water laws. It also wants uniform penalties between basin states for irrigators who don’t comply with regulations. The 736-page final report includes 111 findings and 44 recommendations aimed at improving the effectiveness of the Murray-Darling Basin Plan. The Murray-Darling Basin Authority acted unlawfully when it “completely ignored” climate change projections for the determination of water allocations, it said. “The (sustainable diversion limit) ignores the best available scientific knowledge. The Authority’s “construction of the Water Act has been in error”, the report says, “particularly relating to the definition of the environmentally sustainable level of take”. Walker also slammed the Authority’s secretive administration and refusal to engage with the Commission. “The MDBA is not ASIO,” he writes. “Its scientific inquiries and work should never remain private. Marshall said he would write to Prime Minister Scott Morrison to call a meeting with affected state governments to consider the report, but repeatedly emphasised it had strayed from its initial remit of investigating upstream water theft. “I don’t want to be drawn on providing commentary at this early stage,” he said. Opposition Leader Peter Malinauskas told InDaily while he had only “only just received this very lengthy and detailed report… what is clear though, is that Commissioner Walker raises very serious questions about the conduct of Environment and Water Minister, David Speirs”. “It certainly appears David Speirs has undermined South Australia’s chances over getting the extra water we fought so hard for,” he said. Conservation SA chief Craig Wilkins said the report must “be used to drive a major overhaul of the Murray Darling Basin Plan”. 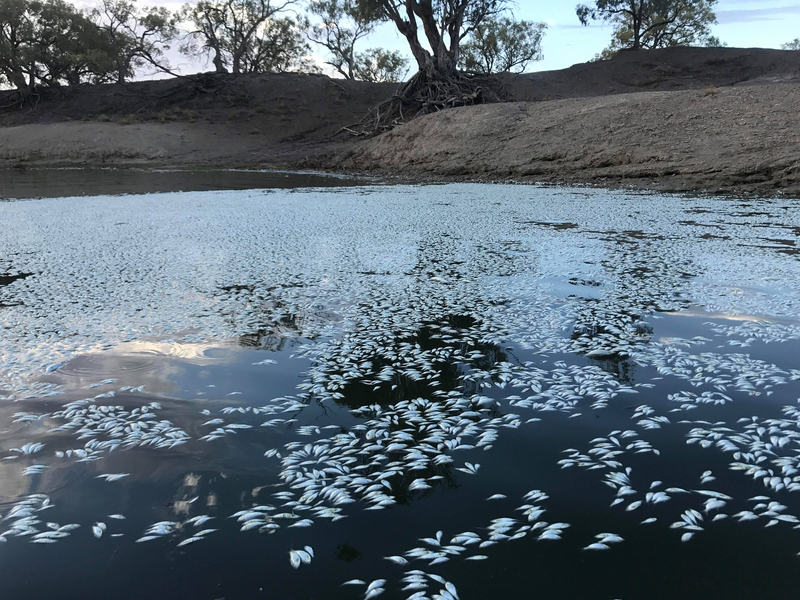 “The recent series of fish kills along the Darling are truly horrifying [and] the Murray Darling Basin Plan, and the $13b taxpayer investment in it, was originally intended to prevent catastrophes such as this,” he said. Walker offered to extend his tenure to examine issues relating to the recent deaths of millions of fish in NSW, although Attorney-General Vickie Chapman rejected that offer, citing cost. The Commissioner did, however, touch on the issue, taking aim at NSW Regional Water Minister Niall Blair. “Charitably, one may not take as a fixed view whatever politicians say, or bluster, in its immediate aftermath,” he writes. “But the statements attributed [to Blair] that have not been disavowed in the days following publication, would (if they are not fake news) display an attitude at the very pinnacle of official responsibility that is in fact grossly irresponsible. REVEALED: Staff, budget cuts as Environment Dept becomes "new agency"
Blair was reported as saying a plan to reconfigure the Menindee Lakes “must” proceed. “How that could be properly asserted before all the various statutory steps and safeguards have been taken and observed beggars the imagination… it threatens a travesty of lawful administrative decision-making, along the lines of ‘the fix is in’,” Walker asserts. “Minister Blair is also said to have warned that not proceeding with the Menindee Lakes Project will ‘blow up’ the Basin Plan itself. The implied position of the NSW Government revealed by this crude language is presumably meant to menace the continued co-operative national endeavour to save the Basin from irreparable degradation. “It amounts to saying that NSW will do what it can to destroy the Plan if this particular highly problematic project is not guaranteed, in advance, to contribute to a reduction in environmental flows and a commensurate increase in irrigation take.